Gardenalgia - n. 1. a hankering for the gardens of our past. 2. nostalgia for old gardens, old ways of gardening, well worn garden tools, heirloom plants, just like grandma had. If I ever had the opportunity to own a garden center, I think I’d name it “Gardenalgia”. I'd sell products and plants that promoted the old ways of gardening, the good old ways of gardening that is. Not the DDT ways, the double-digging ways, the paint-the-tree-trunks-white ways. I'd carry heirloom seeds, well-made tools, native plants, time-tested varieties. Down the aisles, you’d find wide-brimmed straw hats, classically shaped garden urns and planters and the classics of gardening books. There would be room for new stuff, too, but only if it supported and promoted gardenalgia, and helped gardeners find those wonderful gardens of the past in their own gardens. I suppose “Gardenalgia” wouldn't need to be an actual garden center. It could be a brand and that brand could only be put on something that had stood the test of time in the gardens of old. But even if it isn’t a garden center or a brand, I like “gardenalgia” to describe that yearning we have to recreate the gardens of our past, to honor those who gardened before us by planting those plants we know they loved and caring for our gardens the way they cared for theirs. See also Hortalgia, n. 1. a hankering for a specific plant from our past, also called plantalgia. I'd shop at your store. I think it was Russell Page who wrote that most gardeners seek to recreate the garden of their childhood. I know I do, and those native plants and old varieties are an important part. Don't forget the good old gardening books, the classics. Thanks for putting a name to my "disease". Beautiful post. Now you've given a name to the reason I love the country landscapes near me--full of indestructible, unfashionable, but subtly gorgeous plants like mock orange and flag iris. I'd shop there, too, but what about a shop to furnish the garden of one's dreams and fantasies. 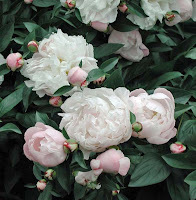 I don't have gardens of memory - although I do grow peonies which remind me of my grandmother. Love the post...even though I don't garden, I appreciate the nostalgia...knowing how much my dad loved to garden. When do you open? What a great idea.